An inverse relationship between the level of high-density lipoprotein (HDL) and coronary heart disease (CHD) has been reported. In contrast, oxidized HDL (oHDL) has been shown to induce neuronal death and may play an important role in the pathogenesis of CHD. In the present study we have investigated a: the effect of various equine estrogens on HDL oxidation, b: the inhibition of LDL oxidation by HDL and c: the effect of these estrogens on LDL oxidation in the presence of HDL. All 11 equine estrogens tested protected the HDL from oxidation in a concentration dependant manner. Equilenin, 17β-dihydroequilenin, and 17α-dihydroequilenin (Δ6–8-estrogens) were found to be the most potent inhibitors of HDL oxidation. Some of the novel ring B unsaturated estrogens were 2.5 to 4 times more potent inhibitors of HDL oxidation than 17β-estradiol. HDL was found to delay LDL oxidation. 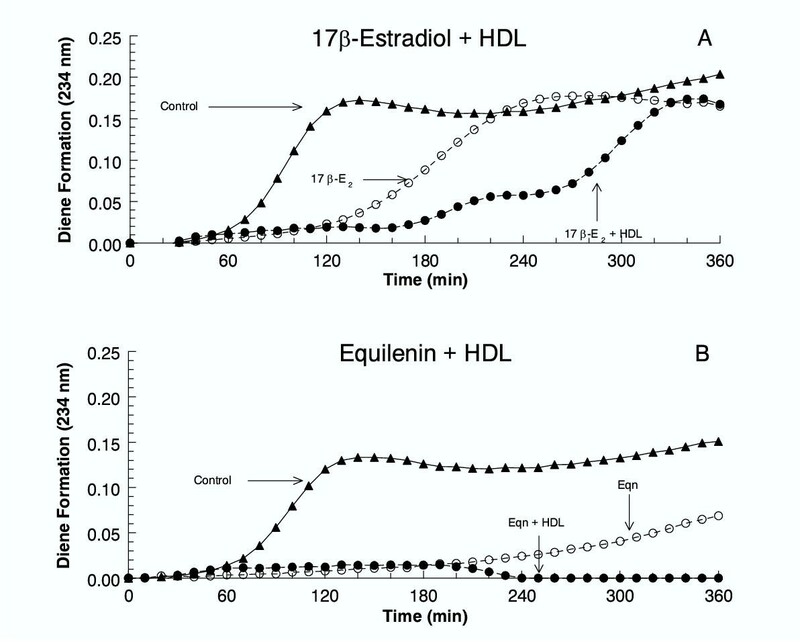 The protection of LDL oxidation by HDL is enhanced by the addition of estrogen, with equilenin being again more potent than 17β-estradiol. Equine estrogens can differentially inhibit the oxidation of HDL with the Δ6–8-estrogens being the most potent antioxidants. The ability of estrogens to enhance HDL's antioxidant activity is to our knowledge the first report of an interaction of estrogen with HDL that results in the delay or inhibition of LDL oxidation. This may be another mechanism by which estrogens may reduce the risk of CHD and neurodegenerative diseases in healthy and younger postmenopausal women. Oxidatively modified lipoproteins, such as oxidized low-density lipoprotein (oLDL) have been implicated in the pathogenesis of atherosclerosis and neurodegenerative diseases such as Alzheimer's disease (AD) [1–5]. This peroxidation of the low-density lipoprotein (LDL) molecule renders it immunogenic and causes monocyte recruitment, foam cell formation and cytotoxicity to various cells including neurons [6–8]. In contrast, epidemiological data has suggested a strong inverse correlation between plasma HDL concentrations and the incidence of coronary and cerebral atherosclerosis [9, 10]. Traditionally, this relationship has been proposed to be due in part to the involvement of HDL in reverse cholesterol transport, however, recent studies have shown that HDL can prevent the oxidation of LDL . This prevention of LDL oxidation by HDL contributes to a decrease in the formation of lipid peroxides, foam cell formation and cytotoxicity otherwise caused by oLDL [12–14]. Recent evidence suggests that HDL associated enzymes such as paroxonase, may play a critical role in this protective effect [15, 16]. However, HDL itself can get oxidized and the ability of oxidized HDL (oHDL) in reverse cholesterol transport is impaired . Furthermore, oHDL is neurotoxic and has been postulated to play a role in the genesis of coronary artery spasm that contributes to the process of CHD [8, 18]. Epidemiological studies have indicated that premenopausal women have a decreased risk for the development of atherosclerosis when compared to that of age-matched males, however, this decreased risk diminishes following menopause . It has therefore been suggested that ovarian hormones, such as estrogen, play a role in the decreased risk observed in premenopausal women. During menopause, plasma LDL and HDL levels increase and decrease respectively, however studies have shown that estrogen replacement therapy (ERT) and hormone replacement therapy (HRT, estrogen plus progestin) alter these levels [20, 21], in that serum total cholesterol and LDL cholesterol decreases while HDL cholesterol increases . Until recently the modification of the plasma LDL:HDL ratio was thought to be the main mechanism for the cardioprotective effects of estrogen observed, however, recent evidence indicates that these play a minor role . More recently, it has been observed that various equine estrogens can also differentially inhibit the oxidation of the LDL and can attenuate the cytotoxicity of oLDL on neuronal cells [8, 24]. In the present study, the effects of various equine estrogens on the oxidation of HDL and the combined effect of estrogen and HDL on LDL oxidation was assessed. The equine estrogens tested in this study were: estrone (E1), 17β-estradiol (17β-E2), 17α-estradiol (17α-E2), equilin (Eq), 17β-dihydroequilin (17β-Eq), 17α-dihydroequilin (17α-Eq), equilenin (Eqn), 17β-dihydroequilenin (17β-Eqn), 17α-dihydroequilenin (17α-Eqn), Δ8-estrone (Δ8-E1), and Δ8,17β-estradiol (Δ8,17β-E2). All estrogens tested, with the exception of Δ8,17β-E2 (a metabolite of Δ8-E1), in their sulfate-conjugated form, are components of the conjugated equine estrogens (CEE; Premarin®, Wyeth Pharmaceuticals, Philadelphia, PA), commonly used by postmenopausal women for ERT and HRT. The structural differences between these estrogens are depicted in Figure 1. Structure of equine estrogens. 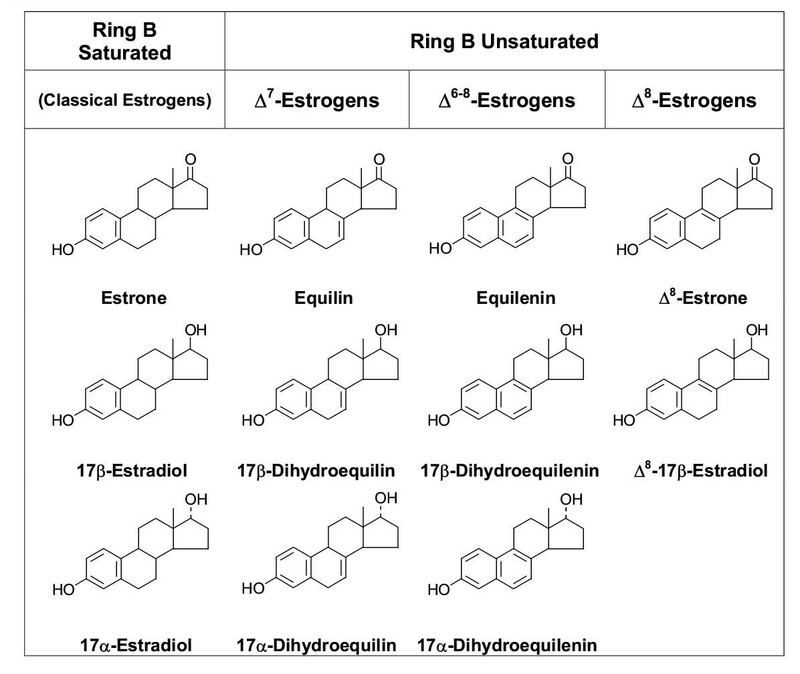 With the exception of Δ8,17β-estradiol, all estrogens in their sulfated form are components present in the estrogen replacement drug CEE (conjugated equine estrogens; Premarin®, Wyeth Pharmaceuticals, PA, USA). The effects of various concentrations of equine estrogens on the kinetics of HDL oxidation induced by Cu2+ were determined as described in the methods. Representative examples of dose-response curves obtained with the various estrogens are shown in Figure 2. Three phases of diene formation were observed in all control samples: an initial induction phase (lag phase), a propagation phase and a decomposition phase (plateau). During the induction phase, the formation of dienes progressed slowly. In the propagation phase, a sharp, linear increase in diene formation was noted and the plateau phase was followed by a slow increase due to decomposition of products. The lag time for control was 65 ± 4 min, and in presence of estrogens, it ranged from 75 to 244 min. Representative concentration-response curves of conjugated-diene formation for various estrogen concentrations against HDL oxidation. (A) 17β-E2, (B) 17β-Eqn (C) E1 (D) Δ8-E1. 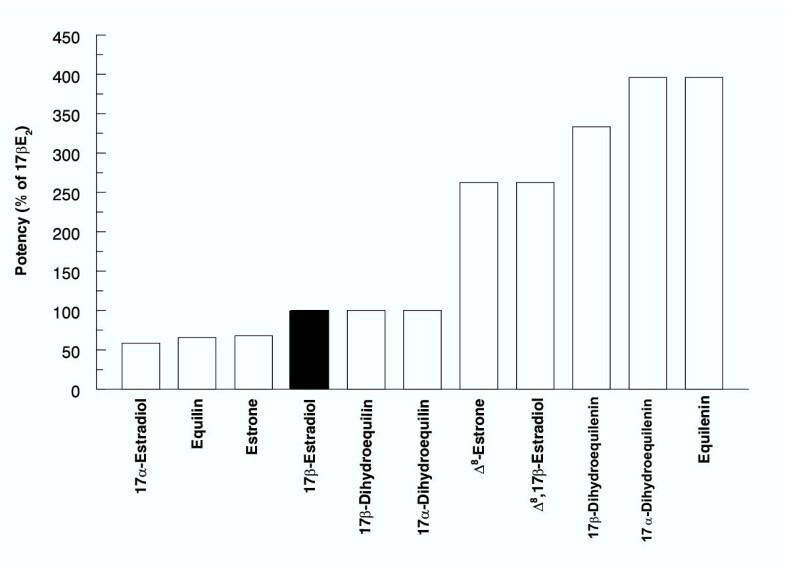 All 11 estrogens tested protected the HDL from oxidation and increased the lag phase in a concentration dependant manner. The results obtained for each of the highest concentration of estrogen tested were expressed as percent of 17β-E2 antioxidant activity (lag time for the highest 17β-E2 concentration used was set to 100%, Figure 3). In the presence of 17β-E2 (0.5 μg, 610 nM) the lag phase increased from a control lag phase of 65 ± 4 min for HDL alone, to 212 ± 4 min (P < 0.001). Similarly, Eqn (0.05 μg, 62.5 nM) increased the lag phase to 200 ± 16 min, as compared to the mean control value of 65 ± 4 min (P < 0.001). This differential effect was observed with most of the estrogens tested such that the order of antioxidant activity from the most potent to least potent was: Eqn = 17α-Eqn > 17β-Eqn > Δ8,17β-E2 = Δ8-E1 > 17α-Eq = 17β-Eq = 17β-E2 > E1 = Eq > 17α-E2. Antioxidant activity of various estrogens measured against the antioxidant potential of 17β-E2. For comparison purposes the 17β-E2 value was set at 100%. The Δ6–8 ring B unsaturated equine estrogens, Eqn, 17β-Eqn and 17α-Eqn, were found to be the most potent inhibitors of HDL oxidation having two- to four-fold higher activity than 17β-E2. Similarly, Δ8-E1 and Δ8,17β-E2 were found to have 150% greater antioxidant activity than control. 17α-Eq and 17β-Eq were found to be equipotent with 17β-E2, while Eq, E1 and 17α-E2 were found to be less potent, with activities ranging from approximately 60 to 70% that of 17β-E2 (Figure 3). The minimum concentration of estrogen required to double the lag phase from a mean (control) lag time of 65 ± 4 min are listed in Table 1. Eqn, 17α-Eqn, 17β-Eqn and Δ8,17β-E2 all required approximately 50 to 80 nM to double the lag phase. In contrast, 17α-Eq, 17β-Eq, Eq, 17β-E2, E1, and 17α-E2 all required approximately 210 to 360 nM concentrations to double the lag phase. The mean control lag phase for oxidation of LDL alone was observed to be 73 ± 1.3 min. When LDL was subjected to oxidation in the presence of HDL the lag phase was prolonged to 104.5 ± 7 min (P < 0.001) (Figure 4). The results indicate that 17β-E2 in the presence of HDL further enhances the inhibition of LDL oxidation than that attained with 17β-E2 alone (Figure 5a). Thus, treatment of LDL with 17β-E2 (0.5 μg, 610 nM) alone prolonged the control oxidation lag time to approximately 140.5 min, while 17β-E2 plus HDL treatment prolonged the oxidation lag time to 251.5 min. A similar effect was observed with Eqn (0.5 μg, 625 nM), however, the combination of Eqn plus HDL completely inhibited the lag phase of LDL oxidation, while Eqn alone prolonged the lag phase of LDL oxidation to greater than 300 min (Figure 5b). Eqn was observed to be more effective at prolonging LDL oxidation lag phase in combination with HDL than 17β-E2 in combination with HDL (Figure 5b). Conjugated-diene formation during oxidation of LDL in the presence of HDL. (Closed triangle) 20 μg LDL alone, (Open circle) 20 μg LDL + 200 μg HDL. Conjugated-diene formation during oxidation of LDL in the presence of HDL and Estrogen. (A) 0.5 μg 17β-E2 + 200 μg HDL, (B) 0.5 μg Eqn + 200 μg HDL. In the present study, we assessed the rate of oxidation of lipoproteins by monitoring continuously the formation of conjugated dienes. The oxidation lag time is a measure of the initial resistance of lipoproteins to oxidation, in our case HDL, and has originally been used for LDL oxidation . The kinetics of HDL oxidation have been previously shown to be mechanistically similar to LDL oxidation . A previous ex vivo study by Meng  and colleagues has shown that the incorporation of very high concentrations of esterified estrogen into HDL can prolong the oxidation lag time of HDL, whether the concentrations of estrogens incorporated inside HDL necessary for protection can be attained in vivo, remains to be determined. In our present study, we found that oHDL formation can be inhibited by all of the 10 known components of CEE and Δ8,17β-E2, an in vivo metabolite of Δ8-E1 . In contrast to the estrogen incorporation study by Meng et al , we have found that in our system antioxidant protection is possible with estrogen concentrations as low as 31 nM. A previous pharmacokinetic study  has shown that circulating estrogen levels following a single oral dose of CEE (2 × 0.625 mg) are > 70 ng/hr/mL, and thus daily pharmacological doses of CEE during ERT or HRT can provide sufficient plasma estrogen levels needed to prevent the oxidation of HDL to the extent we have observed in our in vitro study. Under our experimental conditions, esterification of estrogens was not possible, indicating that inhibition of HDL oxidation by estrogens does not require prior esterification of estrogens. We have observed that estrogens differentially inhibit HDL oxidation. For example, Eq, 17β-Eq, and 17α-Eq all displayed antioxidant activities similar to 17β-E2, whereas the Δ6–8 and Δ8-estrogens had two- to four-fold greater activities. This difference is most likely due to the extra double bonds in the B ring, thus making the molecule more labile and therefore able to scavenge any free radicals produced more readily. 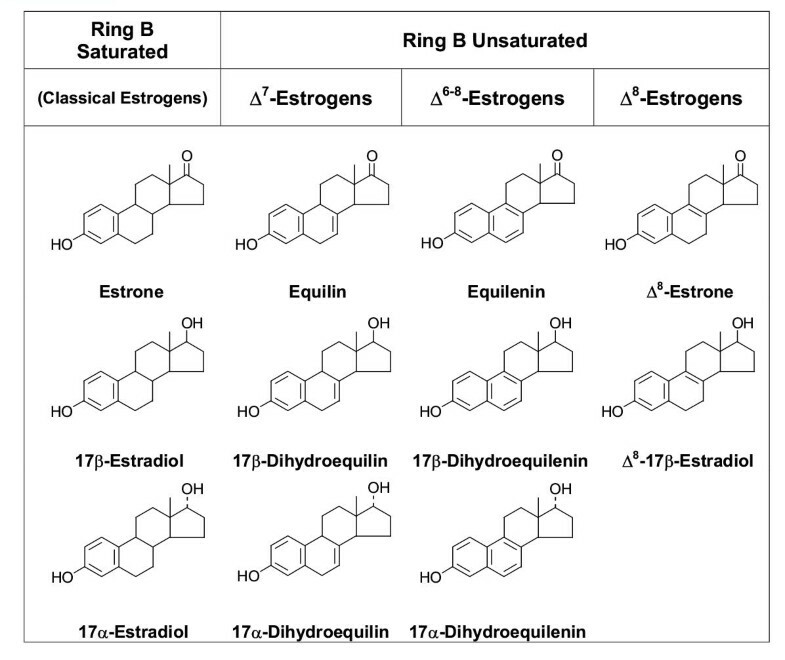 For example, the ring B unsaturated estrogens were more potent antioxidants than the classical estrogens tested. Previous reports have demonstrated that the free radical scavenging activity of estrogen depends upon the phenolic structure of the molecule [30–32]. In addition to this, our observations indicate that the presence of a β-napthol ring, such as that in the Δ6–8 estrogens, may play a larger role in the antioxidant potential observed in these types of estrogens as they were found to be the most potent antioxidants. Thus, our results further extend the observation that the presence of the phenolic A ring and the 3-hydroxyl group is required for steroid antioxidant activity, but unsaturation in the B ring of the steroid moiety greatly enhances estrogens' antioxidant potency. 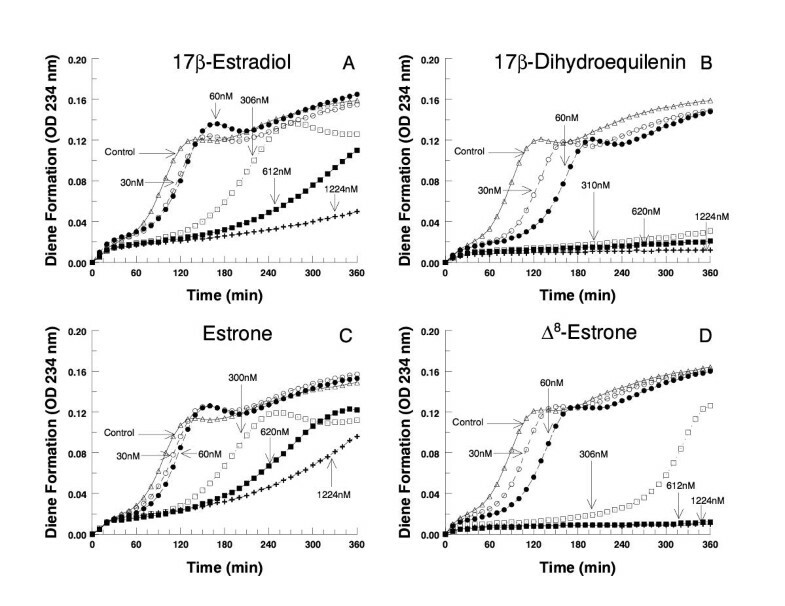 The order of oxidative protection for estrogens tested does not appear to involve estrogen receptors as the relative binding affinities to estrogen receptor (ER) α and β do not correlate with their antioxidant activity. For instance, compared to 17β-E2, the relative binding affinities for the ring B unsaturated estrogens: Eq, Eqn, Δ8-E1 and 17α-Eqn are 2 to 8 times lower for both ERs , whereas these same estrogens with the exception of Eq displayed the highest antioxidant potentials. Moreover, this order of antioxidant activity does not correlate with their uterotropic activities as reported earlier [24, 28, 34]. In addition to the protective effect of HDL on LDL oxidation, we have also observed that the prolongation of LDL oxidation with HDL can be enhanced with the addition of estrogen. Treatment with 17β-E2 plus HDL was more protective than 17β-E2 or HDL alone against LDL oxidation. Similarly, treatment with Eqn plus HDL displayed a greater protection against LDL oxidation than either of the constituents alone. In line with the previously defined order of protection, the Eqn plus HDL combination was observed to have a greater antioxidant effect than the 17β-E2 plus HDL combination against LDL oxidation. Also, the increased protection by the estrogen plus HDL treatment on LDL oxidation is not simply the sum of lag times with HDL or estrogen alone on LDL oxidation, and thus is suggestive of an interaction between estrogen and HDL. This estrogen enhancement of HDL's antioxidant activity is to our knowledge the first reported interaction of estrogen with HDL that causes a delay or inhibition of LDL oxidation. Recently it has been observed that HDL3 is a more effective antioxidant than HDL2 . Following ERT, the main HDL subfraction that is found to increase, is HDL2 . More studies are needed to determine the role of each HDL subfraction in presence of estrogen on the inhibition of LDL oxidation. Although the mechanisms involved in the antioxidant properties of estrogen have not been fully defined, a number of hypotheses have been put forth. Estrogens acting as free radical scavengers are able to break the free radical chain formation produced from membrane oxidation processes and hence inhibit lipid peroxidation. In support of this, it has been postulated that estrogen may be able to sequester metal ions or donate a proton to reduce peroxy-free radicals . Furthermore, the stimulation of Apo-A1 by estrogen may also be of importance . Thus acting as antioxidants directly and by the up-regulation of antioxidant factors may be two additional mechanisms that may be involved in the cardio- and neuroprotective effects of estrogen. In conclusion, these results indicate that HDL oxidation can be differentially inhibited by equine estrogens with the three Δ6–8 ring B unsaturated equine estrogens (Figure 1, Figure 3) being three to four times more potent than 17β-E2. Furthermore, the protection of LDL oxidation by HDL is enhanced in the presence of 17β-E2 and more so by Eqn. The inhibition of HDL oxidation and the enhancement provided by estrogen toward the inhibition of LDL oxidation may therefore be another mechanism by which estrogens reduce the risk of CHD and neurodegenerative diseases in healthy young postmenopausal women. This study has been approved by the Research Ethics Board of St. Michael's Hospital and the University of Toronto. Blood (10 mL) was drawn by venipuncture into vacutainer tubes containing ethylenediaminetetraacetic acid (EDTA; 1 mg/mL) from fasting (overnight), postmenopausal women and healthy men. None of the subjects used were on any hormone therapy. The plasma was stabilized by addition of 6 mg/ml sucrose and either used immediately for lipoprotein isolation or stored at -80C for up to four weeks as described previously . HDL (d = 1.063-1.21 g/mL) and LDL (d = 1.019-1.063 g/mL) were isolated simultaneously by a three gradient, single-step ultracentrifugation as described previously . Following ultracentrifugation the lipoprotein containing fractions (yellow-orange/colour) were collected by aspiration. Crude HDL was further purified by re-ultracentrifugation. Assessment of absorbance at 200 to 300 nm of the crude and purified preparations of HDL, indicated that the crude preparation was essentially similar to the purified preparation and thus the single step method of isolation was used for the experiments described. The LDL isolated by this method had properties similar to those previously described . The freshly isolated lipoproteins were stored at 4C under argon and used within 1 week of preparation. Prior to oxidation, EDTA was removed from the lipoprotein isolate by rapid gel filtration through disposable desalting columns (ECONO-PAC 10 DG, Bio-Rad Laboratories). The concentration of protein in each lipoprotein isolate was measured using the Bradford method (Bio-Rad Protein Assay kit, catalog number 500–0006, Mississauga, ON, Canada) . Oxidation of 50 μg HDL was induced by addition of 1.67 μM CuSO4 in the presence or absence of 0.025 μg, 0.05 μg, 0.25 μg, 0.5 μg, 1 μg of the 11 estrogens. The kinetics of lipoprotein oxidation were assessed by measuring the rate of formation of conjugated dienes measured at 234 nm over a period of 6 hours at 32C. Absorbance was measured in a Beckman DU 640 spectrophotometer equipped with a six-position cuvette changer and a Peltier temperature controller (Beckman Instruments, Mississauga, ON, Canada) essentially as previously described [8, 25]. 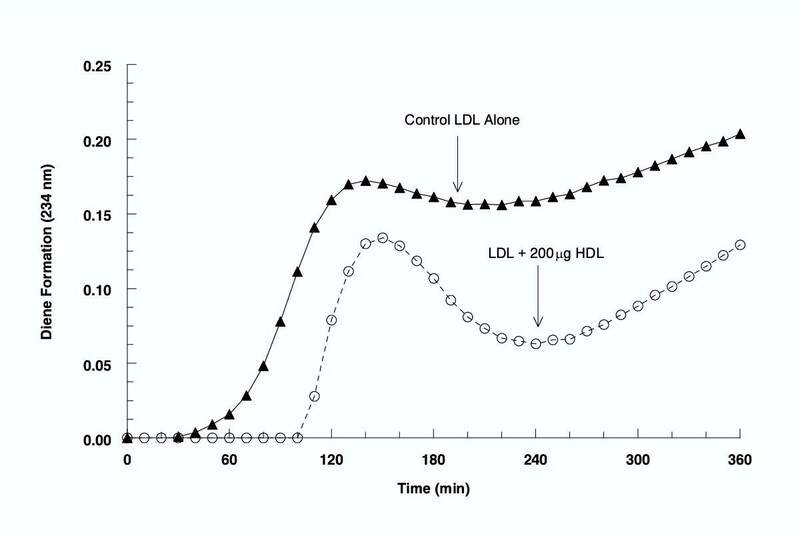 The extent of lipoprotein oxidation was confirmed by assessing the electrophoretic mobility of oHDL and oLDL on a 1% agarose gel in 0.1 M Tris, pH 8.6 compared to the native form of HDL and LDL [3, 8, 45, 46]. Oxidation of 20 μg LDL was induced in a similar manner, however, in this case the effect of 200 μg HDL and the combination of 17β-E2 plus 200 μg HDL or Eqn plus 200 μg HDL on LDL oxidation were assessed. The oxidation lag phase, defined as the point at which the initial slope representing the initiation rate and the point at which the propagation slope intersect, was calculated from the kinetic plot of the change in absorbance versus time as described previously [8, 25, 42]. From the dose response curves, the concentration of each estrogen (nM) required to double the length of the control lag time of oxidation, was calculated. For comparison purposes, all values obtained were adjusted to percent activity of 17β-E2. This work was supported by the medical research council of Canada grant MT-11929 and a basic research grant from Women's Health Care Research, Wyeth Pharmaceuticals, Philadelphia, PA, USA. We wish to thank Ms. Julie Binkley for assisting in the lipoprotein preparations. JP is a graduate student who participated in the development of the hypothesis, study design and carried out most of the experimental work and preparation of the manuscript. MB is a research associate who took part in the development of the hypothesis, study design and carried out the initial experimental work during the developmental phase of the study. AC is a physician who participated in the study design and recruitment of subjects and their clinical evaluation and obtained the consent and blood samples from the subjects. AG is also another physician who participated in the study design and recruitment of subjects and their clinical evaluation and obtained the consent and blood samples from the subjects. BB conceived the study and participated in the development of the hypothesis, the study design, and overall direction of the study and preparation of the manuscript.